I’ve been fairly surprised by how few people seem to be in some of the places I’ve visited here in Piedmont. There’s no doubt that high season is later in the fall when the big truffle celebration goes on for weeks but I expected to see more people and have to deal with some waits. The weather hasn’t been great and I think that’s a factor. Anyway, it allowed me to have a completely private and personal tasting session at Borgogno in the heart of Barolo. These wineries may have storied names, but they’re all new to me. But I’ll have to say I’ll be looking these up again. Here I tried a set of reds. From a simple Barbera D’Alba to the beefiest Barolos. Not knowing much better, I let my tasting guide, Andrea, make some suggestions for me. He’s pictured in the upper right photo pouring one of the wines. The final 3 wines (on the left) were the most interesting wines to me. First, the “No Name”. He had to tell me some of the story there. Apparently it’s a ‘protest’ wine. It can’t be called “Barolo” because of some technicality in the Italian laws so they went out of their way with the name (or rather, no name) to make a point. I didn’t bother to get into the details of the local laws but suffice to say it apparently irritates some of the winemakers. The No Name was decidedly lighter and fruiter in character than the other two true Barolos I tried. Of those two, my clear favorite was the 2009 Liste. Liste is the name of the vineyard. This one was 4 years on oak, one in bottle. By contrast the 2007 Riserva was said to have been aged 6 years on oak, one in bottle. The Liste seemed ready to drink now, while the other was quite a bit more tannic for my taste. Really enjoyed the tasting here and Andrea was really helpful. Andrea also let me take the clear glass elevator up to the top terrace roof deck. Very nice birds eye view. I took some photos there of the countryside before heading on to snag lunch. 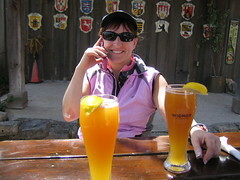 Day 5 of the bike tour was the best of both worlds. At the start, coming out of Yountville there was very little chance of avoiding the Silverado Trail to get to, first, the Sage Canyon Road and then subsequently the Chiles Pope Valley Rd. There were choices this morning and once again I opted for what I hoped would be the most scenic and least traveled roads. You can see the route I took here. As with other mornings this week, it started chilly and overcast. Yount Mill Rd was a beautiful start to things though. The St Helena Hwy was a different story though. Lots of traffic. Thankfully, a nice wide shoulder. Same could be said of the Silverado Trail. Lots of traffic. The shoulder is identified as a bike lane though so that’s at least helpful but the heavy truck and car traffic whizzes by pretty fast. The turn off onto Sage Canyon Rd then up to Lake Hennessey is a welcome change of pace. I was chilled to the bone that morning (temps in the 40’s) but things seemed to start to climb a bit after the turn so that helped me warm up. That 5th day, the only person that wanted to take the option with me was Mark. We had a good time riding this section of road. Very scenic and enjoyable. 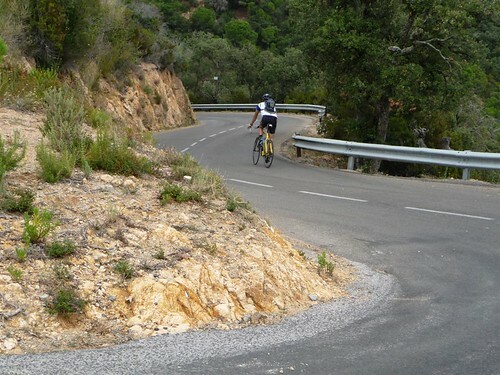 The reason it wasn’t so popular with our fellow riders was it was going to entail climbing over Ink Grade Rd. That was indeed a long climb, but the grade was better than some others we had done and it was up a quiet country road with little traffic so it was fine. Weather was ideal by that point because not only had it warmed up a bit by that point we were working up a sweat. After we crested the climb, it was a fantastic curvy descent down into St Helena. Along the way, we stopped and I took the above photo of the valley. Too bad I couldn’t manage to get the camera out in time to take photos of the deer that were up ahead of us at one point and ran up the hill. St Helena was bustling. Lots of traffic in town but at least it was moving slowly. It was pretty clear from the morning ‘route wrap’ that the tour van and therefore the primary meet-up point would be Gott’s. It’s a roadside burger joint that seems to be really popular. Not that they just have burgers. In this case, I got the California grilled chicken burger – and fries of course. I think this must be one of the original Gott’s. It seems to now be a chain. 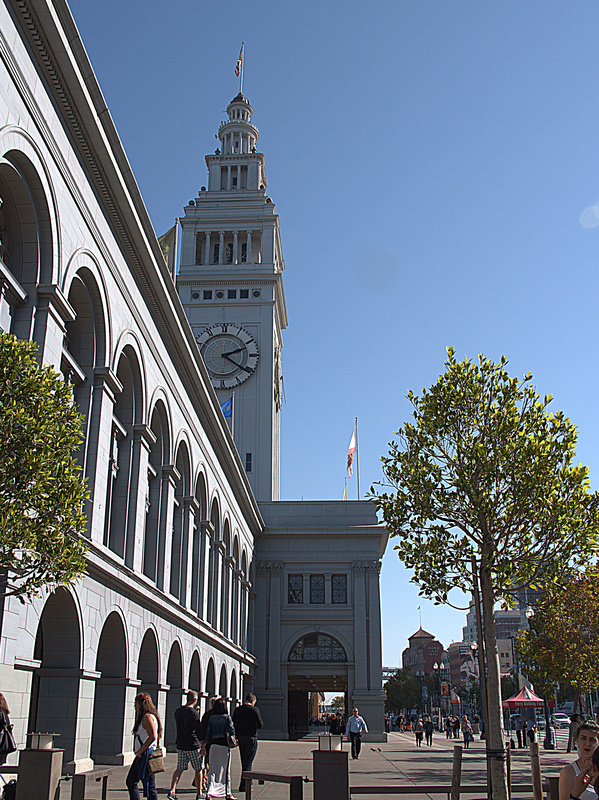 In fact, I went to the one at the Ferry building in San Franciso and took this photo from there. I could have easily finished the ride back to Yountville at this point but given it was all along the St Helena Hwy, its only promise was going to be heavy traffic so I bagged it after my lunch and just grabbed the van back to the Villagio in Yountville. The weather had turned nice in the afternoon after such a chilly start to the day. I grabbed the following photo just outside the Villagio in Yountville after a nice visit to the spa’s hot tub. 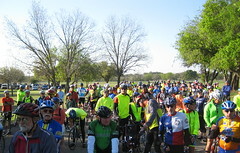 Today is the start of the 40th annual Easter Hill Country Tour. EHCT has rides Friday, Saturday and Sunday over the Easter weekend. There were 3 route choices this Friday. A 25 miler, a 49 miler and an 85 miler. I opted for the 49 miler (which my Garmin tells me is actually closer to 48 miles.) This is a route I’ve done before. In fact, it’s frequently part of the itinerary of the yearly tour. In both 2008 and in 2011 at least the first leg of this route was also covered. Click the map at right for all the gory details. 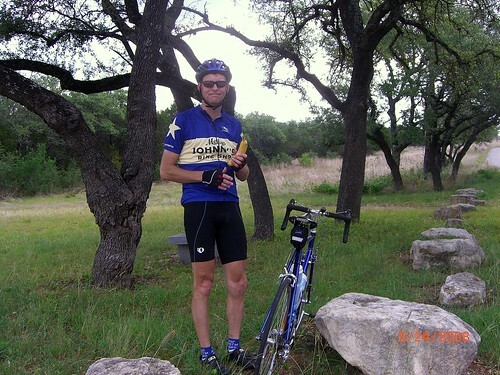 The first leg from Kerrville over to Ingram is perhaps the best part of the ride. At least I think so. Its only downfall is it’s hilly right from the start. But the route is otherwise the most scenic part of the loop ride. Winding, lumpy and rural. Once you get to Ingram you’re subjected to several miles of Hwy 27 as you head west. This is a heavily traveled road though and while there’s a sizable shoulder, the road and shoulder has been surfaced with a really lowgrade chipseal. It’s essentially sizable gravel topped with asphalt and tar. It’s extremely rough even under the best of conditions and uncomfortable to ride a road bike on that has 23c 100 PSI tires. This part of the route is just to be endured. 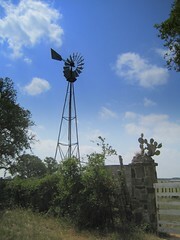 Later of course we would need to turn back toward Kerrville and head into the teeth of that wind for the next 20 miles. Winds were stiff on that last leg of the route. All tolled, a good route and good ride which turned into a really good workout too given the wind and hills. If there was only some way to avoid that section on Hwy 27 I’d sure like this one a lot more. Tomorrow, we take in Hasenwinkel Rd. Always a great route. We finally got a little rain around here. We’ve been in a major drought and haven’t seen much measurable rainfall since last fall. So when a gully washer blew through last Thursday, it was very welcome. That little bit of rain resulted in a bumper crop of Rain Lilies. Rain Lilies are great. They seem to pop up and grown over night a day or so after a rain storm. It doesn’t seem to be every rain storm, but when the conditions are right – and I’m not exactly sure what those conditions are – they pop up and bloom rapidly. Once in awhile you get a bumper crop of them like we did this weekend. They’re everywhere! In big clusters even. My pictures here don’t quite do them justice. I took them with the phone camera while out on a bike ride over the weekend and they didn’t turn out all that well. But, you get a sense of the clusters. These flowers don’t seem to have much of scent unless you’re up close – like right up against your nose. Imagine the scent of a very earthy smelling Easter Lily. That’s sort of it. Sort of. 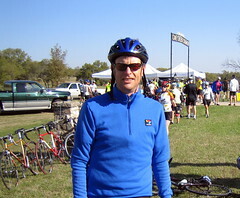 Finally a decent weekend for cycling in the Austin area. Not just decent, pretty much ideal. You know, a mid 70’s, cloudless, light breeze kind of day. Spring has arrived on cue. Trees and bushes have all decided now’s the time to bloom. 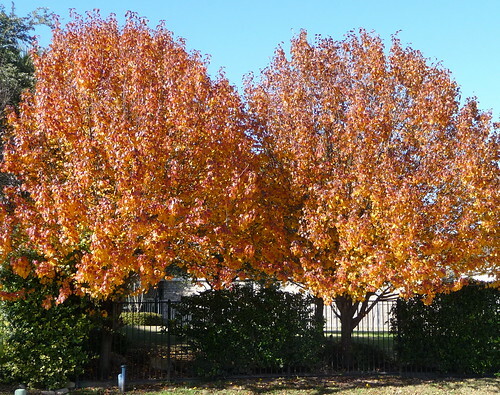 And the Live Oaks are doing their best imitation of what passes for fall color – in the spring. Now’s when they finally get around to dropping their leaves and sprouting new ones. All in a few short weeks. This year they’ve developed a kind of brownish yellow that’s seems just a bit brighter than usual. Couldn’t presuade anyone to go out to Liberty Hill but that’s where I headed. Got a late start because of the time change but still on the ride by about noon. For a change of pace I did a bit different route over otherwise pretty familiar roads. Here’s the route map. About 37 miles. The route included one of my favorite stretches of road out in that neck of the woods, and that’s cty road 336 between Oatmeal and Liberty Hill. It’s not a long stretch, but it rarely has traffic and runs along a creek that’s just pleasant to look at. The picture below was taken along this route. You can see the creek in the background. I couldn’t honestly tell you what the pink flowered bush is. There seemed to be one of these around every bend today. I don’t remember these in other years. Maybe we’re in for a good display of wildflowers this year. All the creeks are flowing so we’ve definitely had enough moisture this winter. No doubt I’ll post a picture here when they arrive. I meant to post this picture and these notes ages ago. October brought with it some weekends of stunning weather. I figured what better time to actually take advantage of having a convertible and drop the top, enjoy the weather and head out into the hill country? There are a lot of interesting destinations out in the hill country west of Austin but sometimes half the fun is just the drive out there. The back roads have little traffic and the hill country offers some excellent vistas. I was also hankering for some German food. Something about the arrival of fall always brings on a quest for some good German food. 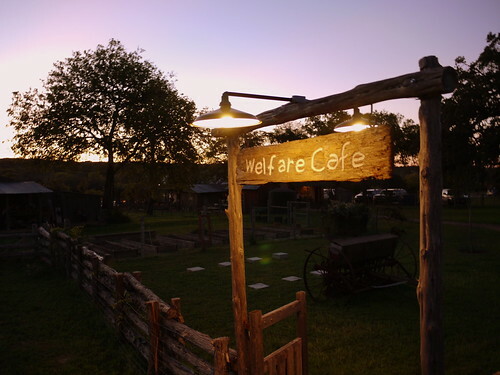 Fredericksburg is a good choice for that, but this time I opted to head for Welfare TX. Welfare is really nothing more than a spot in the road and way off the beaten path. Years ago someone had recommended a place called the Welfare Cafe there. I loved the food then and have always wanted to go back. They make a great schnitzel! The drive out that way also takes you through a tiny little crossroads named Sisterdale. Sisterdale is home of Sister Creek Vineyards. The winery and tasting room are in a restored cotton gin (built in 1885). We pulled in there and checked it out before heading on to Welfare. The trip to Oregon in August had three components to it. The first was a stopover at Mt Hood, the 2nd was in Bend and the 3rd was a visit to the Willamette valley south of Portland. We spent a couple days in Bend. This is the second time I’ve been to Bend and each time I’ve been fortunate to go when the weather was close to ideal. There’s something that just seems to suit me about Bend. Part of it’s the beauty of the area around Bend of course: mountains, lakes, streams, trees. There’s great hiking and biking to be had in and around the area. There’s also a small town feel to the place and yet some big city amenities like interesting restaurants, markets and shops. 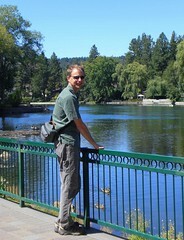 The picture of me off to the right was taken by Kem as we wandered through Drake park near the center of town. The Picasa slide show below is of various points along a hike we did at Tumalo Falls. Tumalo Falls is west of Bend a short drive and in part of the Deschutes National Forest. The hike was around 7 miles and took us along Tumalo Creek. The parking lot and trail starts within view of Tumalo Falls – the largest and first falls shown in the pictures – but along the trail there were easily a half dozen more falls along the stream. We were well past half way on the hike when the trail just seemed to stop. We backtracked a ways to see if maybe we’d just missed a turn. Nope, so we turned back again. The trail just seemed to end at this rather sizable creek. At least it seemed sizable enough that we didn’t feel like wading across it. As we looked more closely, sure enough, the trail proceeded on the other side. In fact, someone had even carved a big arrow into a fallen log that pointed across to the other side. The only way over seemed to require making our way over a fallen tree that was over the creek, but doing so meant first getting to and then climbing over the tree’s sizable root ball. Hmm, maybe not. We wandered a bit further up the creek and found another fallen log. Thankfully this one was a bit easier to climb up on and get across. Our big adventure on an otherwise easy and beautiful hike. Unlike our first day’s warm up ride, this would be a bit longer ride today. I was up early and down for breakfast. Breakfast seems to get started kinda late here. Typically has seemed to be about 8:30. The same was true on Majorca – though they would start things as early as 8:15. Lots of the usual European selections for breakfast: juice, coffee, croissants and some other pasteries and breads, some kind of eggs (boiled, scrambled, fried), sliced meats, sliced cheeses (Manchego and Swiss often), cereals… anyway, lots to chose from. All served buffet style. We checked out and loaded up luggage and were off by 10. 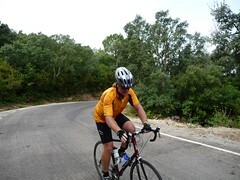 Early on, more riding thru the urban streets of Girona, but it didn’t take long before we were out in the countryside. Pleasant riding on country roads. Not too much traffic. The sights and especially smells of agriculture abounded. Plenty of joking about the overwhelming odor of pig manure. It’s the country, that’s what you can expect. Girona appears to be in a valley. To the east – the direction we were headed – you need to pass over a range of pretty big hills to get to the coast. I’m not sure I’d call them mountains, but they are certainly mountainous. Before we hit these we pulled into a small town named Llagostera. We headed for the central square and stopped in for coffee and snacks. 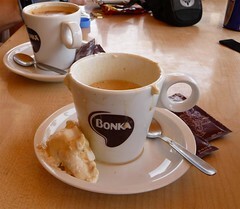 One of the great things about the Jemison tours are they take time out for coffee and/or lunch stops. You don’t just pound until the ride’s done. I got a cappucino. You’ll see it in my pictures. Around here they seem to make their cappucino’s with whipped cream, not just milk foam. Anyway, it hit the spot. The riding had been pretty easy up to this point, but soon after our coffee stop, we headed into the hills. It was a long climb. The longest we’d done up to that point anyway. About 10K of something in the neighborhood of 5-8% grades up winding roads. Very pretty country. It wasn’t long before pretty much everyone was huffing a bit. The weather was warm and we were working up a sweat. While it was a long’ish climb, the grade really wasn’t that bad. Below is a shot of the fun winding roads we did. Chris, our ride lead, provided a very consistent pace for us to fall in behind. I stuck to his wheel until maybe 8K into it and then started to fall behind a little. Celeste, who lives in Park City and rides at altitude, had little trouble. All in all though, the group has kept a very consistent pace, even on the hills. In my experience, that’s fairly rare on bike tours like this. Once we crested the hill, the descent down the other side was fantastic. The grade was steeper on the other side: 14% toward the top, and the distance down to the sea shorter. Maybe 5-6K. What great views of the Meditteranean from up there though. We stopped at several points and took some photos. Back and forth through winding roads and pretty scenery. It’s very rugged, rocky country. Our descent T’d into a road that hugs the coast line. 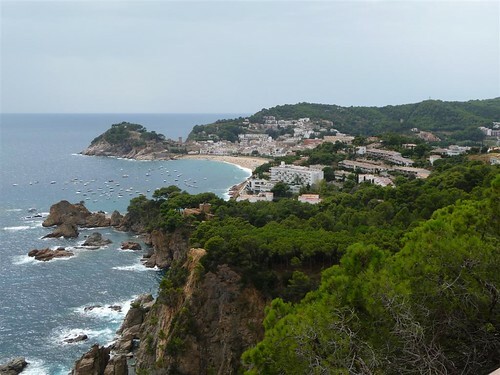 From there we headed south to Tossa de Mar. The coastal road is “undulating”. Meaning we still had several interesting climbs to get in to Tossa de Mar. Sept may be the shoulder season for this area, but there are still a lot of tourists. We wound our way through the narrow streets full of shops and people just strolling around until we got down to our hotel next to the beach. We stayed at the Hotel Diana. You’ll see pictures here. The group snagged a table on the patio inside to get room keys and some snacks. Everyone tried a little Sangria as well. That’s a light colored/bodied, chilled (iced) red wine with chunks of fruit in it. In this case, pears, apples and oranges. Refreshing. A couple people had beers. You see a lot of San Miguel and Estrella Damm – both Spanish. My room was great. Simple and small but it had a great little deck with a couple of chairs and a great view of the sea. The bathroom had a very cool window beside the shower that let in a great breeze. 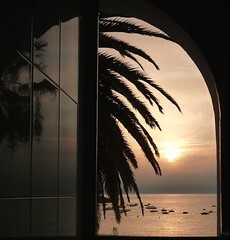 You’ll see a picture here that I took one morning of the sunrise out that window. 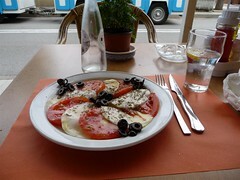 I was starved and grabbed a quick snack of tomatoes & mozzarella. Tasty. Included a shot here. I didn’t spend too much time down at the beach. It’s beautiful to look at, but I’m not much for swimming, but I did wander up and down it for a bit. The ‘sand’ is much coarser than it looks from a distance. More like tiny stones. Not entirely foot friendly – at least unless you spend a lot of time bare foot. Of course there were plenty of folks on the beach that seemed to like it just fine. Later the group went to dinner at a place that our ride lead Chris had chosen. It’s a family run pizza joint a few blocks from the hotel. Wish I could remember the name. We had salads and pizza. Excellent stuff. Chris later took us on a walk around the area. Not for too long though. Most of us were pretty tired. There’s an old fortress at one end of the town up on a rock outcropping. We walked up there and looked out over another small beach on the other side. The sea was illuminated by the moon. It was a pretty spactacular view from up there. I took a picture of it, but it’s on the internal memory of my camera not the removable memory and I don’t have the cable. 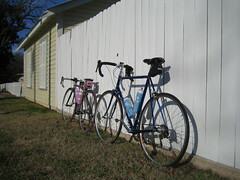 Last weekend Kem and I rode the tandem down to Austin Java to grab a late morning breakfast. The weather was warm but ideal to get out and enjoy it. The week before we’d had some pretty bad storms in Austin and the bike route we took required that we not once but twice pick the tandem up and lift it over fallen tree limbs. What a mess! But quite the adventure. The storm made a mess of west Austin. Lots of hail damage and wind damage that was surprisingly extensive. Tree limbs down everywhere. The hail had sheered off a lot of leaves as well and for a week there it seemed like all you could hear were the sound of leaf blowers. Anyway, we managed the trip down to Barton Springs Rd and Austin Java despite the obstacles. 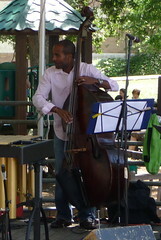 They had a great little jazz band playing and we managed to snag a table out on the patio. Breakfast Quesadillas. Mmmm. On the way back, we pulled in to Central Market to pick up some food for later. They had a band playing as well so we stopped to listen for a short while. One of the nice things about Austin is you can find interesting live music like this all the time. Yesterday was the Pedal Power Wildflower Ride out in Stonewall. Actually, it starts from the park at the LBJ ranch, but I guess that is considered Stonewall. The ride name is a bit of a mouthful to say so I just way “Pedal Power ride”. I love the 60 miler route they do on this ride because it includes the Willow City Loop. 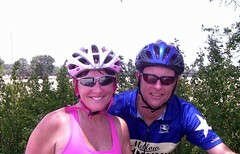 Kem’s off the bike for awhile so Jim and I did this ride. It’s a bit of a hike out to Stonewall so we were up before sunrise packing things up and heading out. Leaving from Jim’s up north we routed through Marble Falls on the way out. 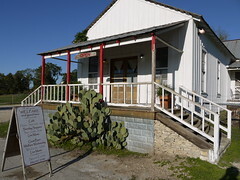 We had plenty of time so pulled into the Bluebonnet Cafe – home style cookin since 1929 – for some breakfast on the way. I don’t usually go for a big ranch hand style breakfast, but I figured I’d be burning more than a few calories on the ride so opt’ed for a really big breakfast. Scrambled eggs, hash browns, bacon, biscuits – with gravy of course! – and coffee. Holy cow! Lots o’ food. Gravy for breakfast is over the top but then there was the rest stop food along the ride. There was the usual bananas and cookies and things like that, but a couple of the stops had full sized sausage wraps, slices of what appeared to be summer sausage and two kinds of cheese cubes! Not your typical ride food. Had I not had the monster breakfast I might have given some of that a try but instead stuck with the bananas. Ordinarily the route through the Willow City Loop is loaded with flowers at this time of year. Might have just caught it at the wrong time but this year, very few flowers. You really had to look for any at all. Last year Kem and I rode the same route and the area was blanketed with them. Although I have no pictures of it, I thought I’d also quickly mention last week’s Rosedale ride. It was cold and damp last week but I decided to go anyway. That ride is always really well attended. 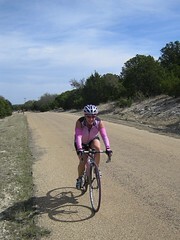 The routes are pretty flat ones northeast of Austin. Thankfully it never rained though it did sprinkle for a bit. For some reason people have a tendency on that ride to take off fast. The group seems to have this collective pent up need to race. Winds were out of the north and yet we were still humming along at a 20’ish mph pace as a group. I was humming along quite nicely at the 24 mile point when bam! I snagged a nail in my rear tire. That’s actually a first for me. I’ve never picked up a full sized nail before. I hadn’t even seen it. Stuck in there it made quite a racket. Thankfully the tire wasn’t destroyed when it blew so I was able to just put in a new tube. I had trouble getting air in the tire though but some really kind soul named Tom happend by, stopped and filled it with one of those air canisters. I’m finally getting around to jotting down a few notes from this year’s Easter Hill Country Tour. Aside from a woeful fall that Kem had – which I’ll get to – the rides and weather were really great this year. For those following along, last year’s EHCT was largely snuffed out mid stream by freezing temps and sleet on Saturday. Though as you can see from the link, the flowers on the ride that Friday were amazing. 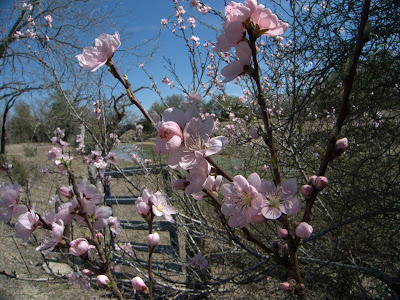 Easter came much earlier this year though and consequently there were very few flowers to speak of along the routes. Friday we opt’ed for the 44 miler. Last year we had done that same route and done the 60 miler but we figured this year we’d save the longer ride for Saturday. The route north of Fredericksburg is one of my favs. The views back over the valley after climbing Lower Crab Apple are always worth a short stop. And I love the section along Welge-Hausen where you zoom down hill with Enchanted Rock looming in the distance. The picture here is one I took on last year’s ride. Our Friday ride was nearly complete – we had maybe a half mile or so to go – and Kem took a tumble off her bike. Thankfully she had a good helmet. It cracked instead of her head. Aside from a headache – not surprisingly – she otherwise seemed fine though we would later find she had injured her shoulder in the fall and is currently in a sling and off the bike for another 4 weeks or so. Kem opt’ed wisely to just rest on Saturday. 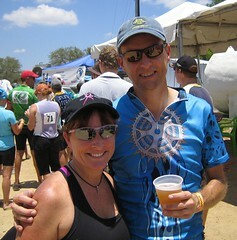 I made the trip down to Kerrville and did the 60 miler. Another really nice hill country route. The first hour of the route was largely up hill and got us warmed up pretty quickly. The hill on “Freedom Trail Rd” had a lot of people slowed to a crawl. The section along hwy 27 is not my fav because of traffic but at least there’s a wide shoulder. The rest, particular along White Oak Rd and Zenner-Ahrens are quiet scenic sections of the route. Friday night we managed to make it back to one of my favorite restaurants in that area. 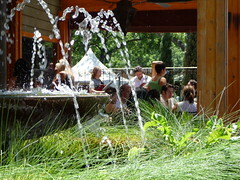 The Hill Top Cafe. Johnny Nicholas played the piano/harmonica and sang a little too. We’d gone out there last year too. The food’s great and oh yeah, they make great pies! Finally, a few notes for anyone involved in planning the EHCT that happens along this write-up. Two words: More toilets. The rest stops had only 1 portable toilet. The start of the ride had only 2! Sigh. And a little variety at the rest stops would be nice. Bananas, pretzels and pickle juice at every stop. You have searched the archives for fall. If you are unable to find anything in these search results, you can try one of these links.